The success of Donkey Kong Country inevitably saw a sequel released. 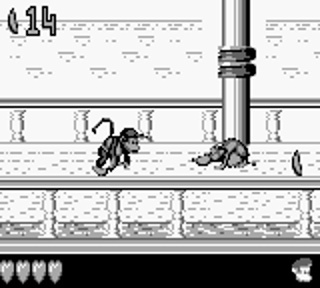 Likewise when Donkey Kong Land proved a similar platforming experience was possible on the Game Boy, it was a no-brainer that Rare would release a second handheld adventure. This time Donkey Kong has gone and gotten himself captured, and so it's up to Diddy and Dixie to run, jump and swim their way through Donkey Kong Land 2 to rescue him. Considering the hardware's limitations the first Game Boy game did a good job of capturing the look of Donkey Kong Country, but sometimes suffered from the different elements blending together. For this game Rare has addressed the problem by having a bit less detail on-screen, mainly achieved with plainer backgrounds. 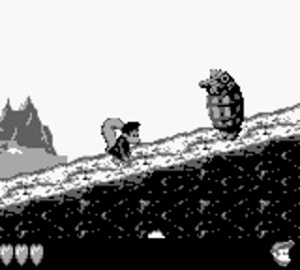 There's still the occasional confusing moment (safe wooden platforms being hard to pick out from thorny vines for instance) and the odd graphical glitch, but overall the action is easy to follow; you're not going to find yourself getting clobbered by a Kremling you thought was a juniper bush. Audio-wise the game has a few sounds for things like collecting bananas, bouncing off the heads of enemies and the crashing of barrels, but once again it's the music that impresses. Though sometimes a bit beepy there's a variety of fun, catchy, adventurous tunes. Other tracks go for mysterious, whilst the boss battles use a piece that's a bit more intense. The odd track can get a bit repetitive if you stay on a level too long but the game is certainly enhanced by the music featured here. There's a range of foes throughout the game with the Kremling's going for a pirate theme. King K. Rool is now Kaptain K. Rool (complete with blunderbuss) whilst other Kremlings have cutlasses, hooks and peg-legs. More enemies can be found in the waters (piranhas and stingrays) and the skies (wasps and dragon flies). The levels are varied too: winds blow you back, other winds blow you upwards, sometimes you'll be jumping between platforms, other times shimmying along a rope. The action is certainly kept interesting and each level also includes treasure to find: Kremcoins, Banana Bunch Koins and Cranky's particularly hard to find Video Game Hero Coins. Whilst Cranky doesn't appear in-game, there are two Kongs who provide you with help. Funky Kong's Funky Flight's service is used to travel to previous worlds and Wrinkly Kong will save your game for you if you visit her Kong Kollege; both of these services require payment of banana koins. There are problems with this method of saving as it means you have to clear a few levels in a world before you can save your progress — having done that you may find you lack the banana coins necessary. The coins are easy to come by, but it will mean replaying a level first. Whilst this adds a bit of challenge as players must collect enough of the coins if they want to save, it doesn't make sense for a portable title that may only be played in short bursts. Luckily this is a Virtual Console release and whilst that means the (admittedly slight) Super Game Boy enhancements are gone, the restore point feature is available — which is a much better option for gaming on the go. As fun as the levels are, anyone who has played Diddy's Kong Quest will find things here very familiar. The map screens closely resemble the 16-bit title and levels have the same names, although a few didn't make the cut. Whilst the levels are not identical, you do have to do the same things on them, so 'Mainbrace Mayhem' has you climbing masts to reach the goal, rising liquid causes trouble on 'Slime Climb' and 'Rickety Race' sees the Kongs in a speeding roller-coaster cart trying to knock Kremlings off the rails. 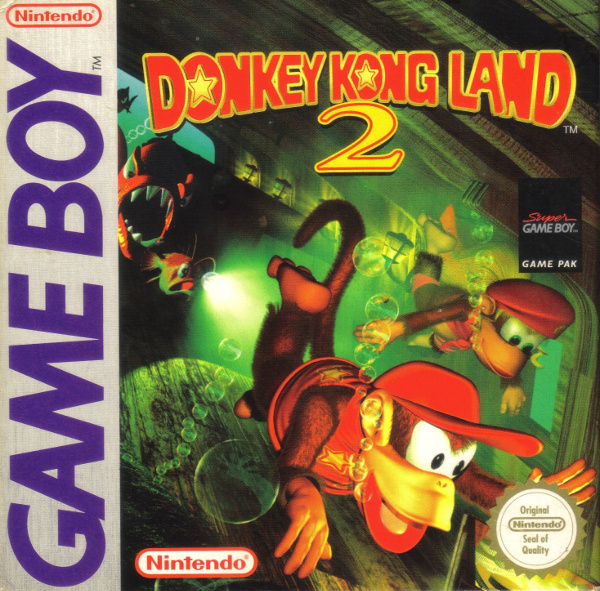 It's quite interesting to play alternate versions of these levels (and there are a couple of stages unique to this title), but it's a shame things aren't a bit more like the first Donkey Kong Land which had new levels, new environments and even a few new enemies. The controls are responsive with the two Kongs doing what your thumbs ask of them. As before A jumps and B is used for running, throwing and spin-attacking. Holding B whilst in mid-air with Dixie allows her to perform a helicopter spin and slowly float downwards — handy for clearing large gaps. The Select button switches between Kongs and is also used when controlling some of your animal friends. There are a number of animals who appear in certain levels to help you with your quest and their abilities come in very handy. Holding Select down is used to perform charge attacks with Enguarde the swordfish and Rambi the rhino. For Rattly the snake it is used to jump higher. Whilst the Select button works OK for those actions, players may get frustrated when using Squitter the Spider. Certain sections require the spider to make web platforms to jump between — to do this you must fire a web with the B button (sometimes using up or down for direction) and then tap Select to set it in place. The platforms only stay in place for a short time before dissolving so you have to work quickly. This method was not ideal on the original hardware and due to the button placement would be even trickier on the 3DS were Select not also mapped to the much more convenient Y button. 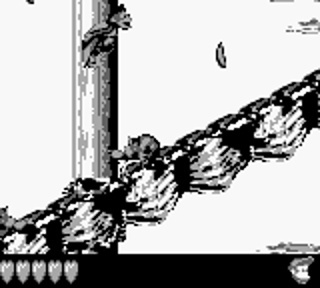 The 'Toxic Tower' level towards the end of the game sees Squitter having to make platforms to escape some rapidly rising toxic sludge, so mastering the technique is a must. Players who do become the best web-spinner since Ben Reilly will find earlier levels with Squitter quite easy as you can just web-platform yourself over the dangers below. Similarly, find a high enough platform and Dixie's helicopter spin can be used to sail over long stretches of Kremlings and obstacles. Whilst this can make some levels easier, it also makes bonus areas and coins easily missed. The difficulty is nevertheless well judged, overall, with the game starting off quite easy and then steadily becoming trickier. Hidden coins also become harder to find as you progress. To help you out extra life balloons are scattered throughout and you can also acquire extra lives by collecting 100 bananas or picking up the letters that spell out KONG on a level. Your save file includes a percentage score so you can see at a glance how much of the game you have cleared. With 40 levels to beat and Kremkoins and Video Game Hero coins to find, anyone aiming for full completion will be kept busy. Acquire enough Kremkoins and you can gain access to the Lost World which features the final six levels of the game. If you have cleared/collected everything it's worth noting that your save file also lists the time you've spent playing the game, so you could always try to do it again but faster. With more levels to play through and extra items to collect Donkey Kong Land 2 is certainly a bigger game than its predecessor, however it's not quite as impressive due to being a bit too similar to Diddy's SNES outing. 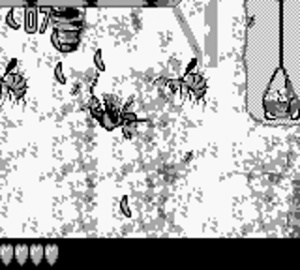 Luckily the varied bunch of levels and enemies ensure that the game is still fun to play through. There's some cracking music, too, and with the amount of content Rare managed to cram into the game there's enough here to keep players occupied for some time. I was considering this but if it's basically a portable DKC2 it seems I'm better off passing for now. @Hero-of-WiiU Mystic Quest aka Final Fantasy Adventure aka Seiken Densetsu begs to differ. sigh ....... where is the NA release? When will we get this gem of joy?? Just a 7? I've always thought of it as a 9 or 10. One of the best games of the handheld. 7 seems a bit low. Being similar to the SNES game, in this particular case, should be a feature, not a bug, since DKC2 is, in my opinion, one of the greatest platforming masterpieces of all time. @ZenTurtle Man, I'd trade you that in a heartbeat. It's a shame they didn't go the DKL way (having original enemies and levels) but this is otherwise an improvement over the Gameboy original original. Movement is now better, in DKL jumping was so stiff. SNES counterpart is obviously better but DKL2 is still a 9/10 gem. DKL2 and 3 are in top 5 Game Boy games easily. Wasn't this one's music the first job Grant Kirkhope did at Rare? If so he made a damn fine work with "In a Snowbound Land"´s GB version. The day when we get Kirby Tilt N´Tumble. Never. Thankfully I bought Twisted and it's the best Warioware title (and the ONLY ONE not released here!). @Undead_terror Yeah but the best one is DKC2 and we have the broken 50hz version. This is my favorite Game Boy game ever. This should get a 9 or 10. You probably gave it a 7 just because of the SNES counterpart. 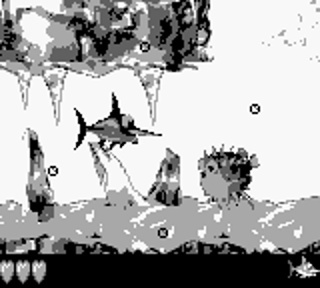 Admit it: is there a single Game Boy or Game Boy Color game that is better than DKL2? Maybe Pokemon, but even I prioritize this game over Pokemon. Thing is, North American players often tend to forget about the truckload of stuff European players don't get. @JaxonH "The wait is over. Finally!!!!!" My only critique is you don't have much control over the height of your jump, (unless you use Dixie's helicopter spin mid-jump) making a few jumps tricky, (as your normal jump is quite high) but regardless the physics are much improved over the first DKL. I also like how well DKC2's soundtrack translates to 8-bit. I like this game but it does have some problems. If you want to save you have to get to the Kong Kollege and you can’t save in previous Kolleges in other worlds because you can’t go back to the world selection unless you defeat the boss or turn it off and turn it back on again, which will just delete your progress. Also if you play the game on Gameboys without color, you can’t differentiate some things very well and when you save it doesn’t save your coins or your lives.